Blood Trail is a realistic horror VR adventure game developed by Electrovore. You will play as Wndigo, a heard-hearted contract killer motivated by a paycheck and tasked with annihilating a fanatical cult. Built from the ground up for VR using proprietary character physics and gore systems, the game offers an unprecedented shooting experience not for the faint of heart. The game gives you Arcade Mode with 3 unique arena style maps where you will face an onslaught of enemies in a fast-paced shootout as well as the infamous “sandbox room”, where you get a helpless victim and blank canvas to paint on with our dynamic gore system. 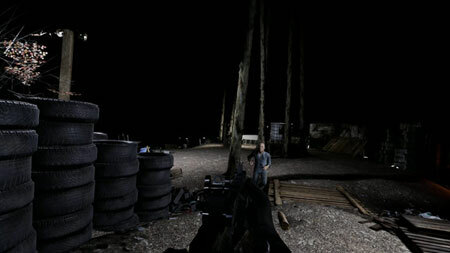 With realistic gun mechanics and damage effects, you will have no margin for error as you use your pistol, shotgun, rifle and fists to become the last man standing in this nightmarish and brutal scenario. Enjoy a full, story driven, single-player campaign with infiltration style missions as well as huge shootouts and quiet moments of terror. If you get stuck in the game, check out the video walkthrough and gameplay for the game. This entry was posted in PC Games, Walkthrough and tagged Blood Trail Cheats, Blood Trail Gameplay, Blood Trail Guide, Blood Trail Strategy, Blood Trail Walkthrough by Marvin. Bookmark the permalink.